What it needs right now is more art! I couldn't draw a picture to save my life, so I'm out (right?). But I have seen things around the blog-o-sphere. You guys can do all kinds of cool stuff! You can do this. And there will be sad kittens if you don't. Did I mention the kittens? They'll be sad. Who'd want that? Seriously, if you got the time and the energy, contribute and get your stuff out there. Help realizing this great community project. Have a Happy New Year you all! Part 3 A is here. Here I go again. This time it really is the final installment of this series of posts. 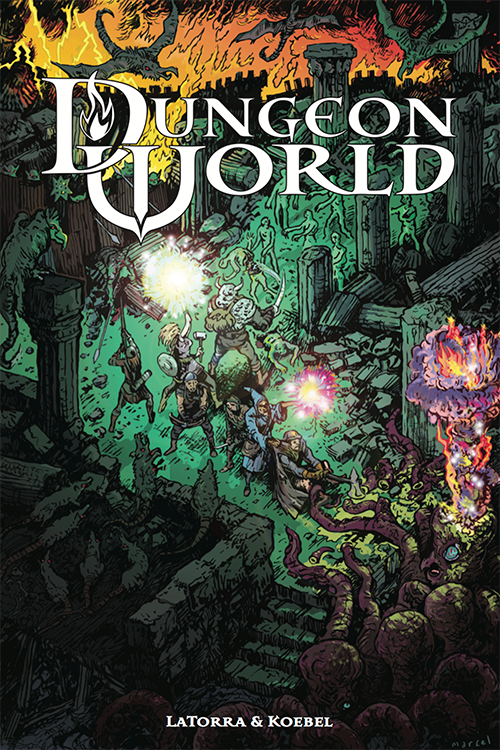 I'll write a few words about how I'd house-rule Dungeon World and talk about some ideas how parts of DW could be salvaged and used in another game. Still a lot, but Dungeon World offers a lot, so that's just fair. In closing I'll give my overall impression of Dungeon World and an outlook what I intent to do with it in the future. There is a chapter in Dungeon World on how to alter those rules called Advanced Delving. In it you get told how to build new moves and how to change aspects of the rules to adapt them to a different campaign. I don't like this chapter, as it mostly tells me what I can't or shouldn't do, most of the time using empty phrases to explain why it shouldn't be changed. An inexperienced DM will be intimidated by this and that's just wrong. If you tinker with a game and it breaks, you've learned a far more valuable lesson than by learning how to obey the system. A Game Master is not the slave of the system he uses and if a set of rules tries to tell me otherwise, it gets the finger. Then it gets tinkered with until it breaks and what is left gets looted ... Anyway, let's be constructive about this. The first thing I'd drop would be the 2d6 (plus bonuses). Every move a character makes will be at least partially successful with a result of 7. The bell curve results of 2d6 will make it very likely that this comes to pass and every bonus a character might be able to add will make this already-too-easy-to-reach result even more probable. I don't like those chances. This would make beginning characters somewhat weaker and keeps a linear distribution of results up to a level where it is just another small boon for already powerful characters. No such thing is mentioned in the rules as an alternative. It's not even touched. The next thing I'd probably change is "Be a fan of the characters." I know, they write this can't be done without destroying the game, but I'd rather "be a fan of the players" and make the deaths of characters a bit more likely (and less hard on the players). That's all I got, though. More ideas maybe after giving Dungeon World a few runs at the table. By now I've read often enough that D&D and Dungeon World as games couldn't be further away from each other. And that's somewhat true. But both system will also result in a very similar gaming experience. Not only because of some overlapping terminology (which certainly helps), but also for using the same tropes. A Dungeon World player and a D&D player could talk shop and understand each other easily without the need to explain the rules (in most cases, anyway). And this is what makes me believe that parts of the rules in Dungeon World could almost with no effort fall into the cracks the D&D rules offer. For one thing, Dungeon World is not that intrusive. The system itself is fast and easy and most of the narrative tools could really improve any game for a DM. Another reason would be the modular nature of most role playing games. There is no part of the rules in D&D that couldn't be changed or altered. It has been done often enough, even between editions. Those are the "cracks" I'm talking about. Take the DW rules for henchmen, for instance (can be found here, but you need to scroll down a bit, in the book it's on the pages 34 - 37). They are defined by 3 scores: skill,cost and loyalty. A hireling may have one or more skills that will help the characters one way or another. Where the hireling comes from determines how high his skills are (a village will give a DM less points to distribute than a city, etc.). A cost might be money, but might as well be "The Thrill of Victory" or "Fame and Glory". Loyalty changes according to how they are treated and if their costs are met. Reaction roll is 2d6 + loyalty. Easy as that. You could take that as it is or change a bit to reflect that characters on higher levels have more hp, but as it is, it won't be more than what would be given anyway under the described situations. It's good as it is. Using those rules gives a DM an elegant little system to handle hirelings in the game. Same goes for travel and making camp (read about the special moves in this chapter to get an impression). Many good ideas to keep the focus on the adventure and not just narrate the interludes, but give them some significant randomness with just one roll. At the end of each session you may resolve one bond. Resolution of a bond depends on both you and the player of the character you share the bond with: you suggest that the bond has been resolved and, if they agree, it is. When you resolve a bond, you get to mark XP . I'd maybe give 50-100 xp per level for a resolved bond. 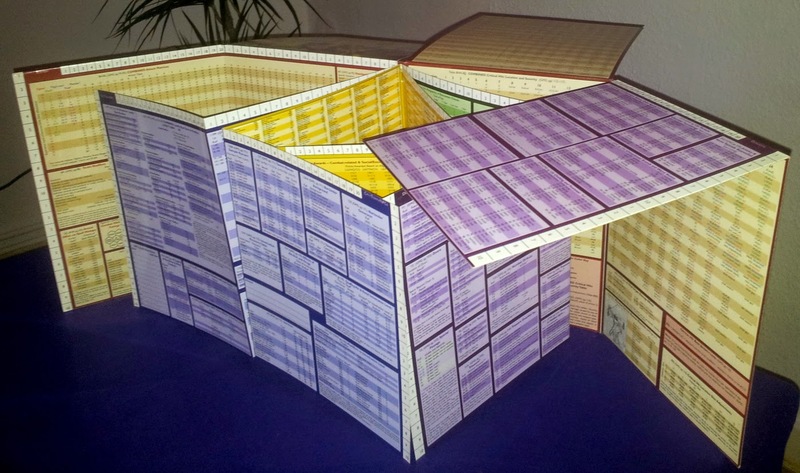 Easy cut and paste job, works for all games that not already have something similar (which means most D&D variants). It's just a minor narrative twist, but it should help enriching a game. But the true gems are in the GM section, especially the chapters about building fronts and building a world are full of genius. With this alone a DM gets everything he needs to build a structured living and breathing environment for the characters to roam. The ideas how settlements interact, grow, etc. are inspired. Most of the things a DM can do in Dungeon World will also work in other games. In most cases enhancing the gaming experience, too. Dungeon World is a good game with some seriously brilliant ideas in between. It captures the feel of the older editions of D&D (and 5E?) mostly by using the terminology, tropes and mimicking the character creation process (3d6 per ability score, etc.). The game does a good job in emulating all that into a narrative that will in almost all aspects mirror that of a game of D&D, although it takes a very different (and easier) road to get there. In my opinion a good game for a DM to have for those moments when you are in the mood for some D&D fantasy role playing, but too lazy to prepare a game of D&D. The strong focus on the narrative while playing it is weakness and strength at the same time. Depending on your skill as a DM it might be a breeze to referee this game, but the very structured and ritualized set of rules gives just the illusion of freedom (especially regarding the players) for what is in reality a very restricted and scripted game. 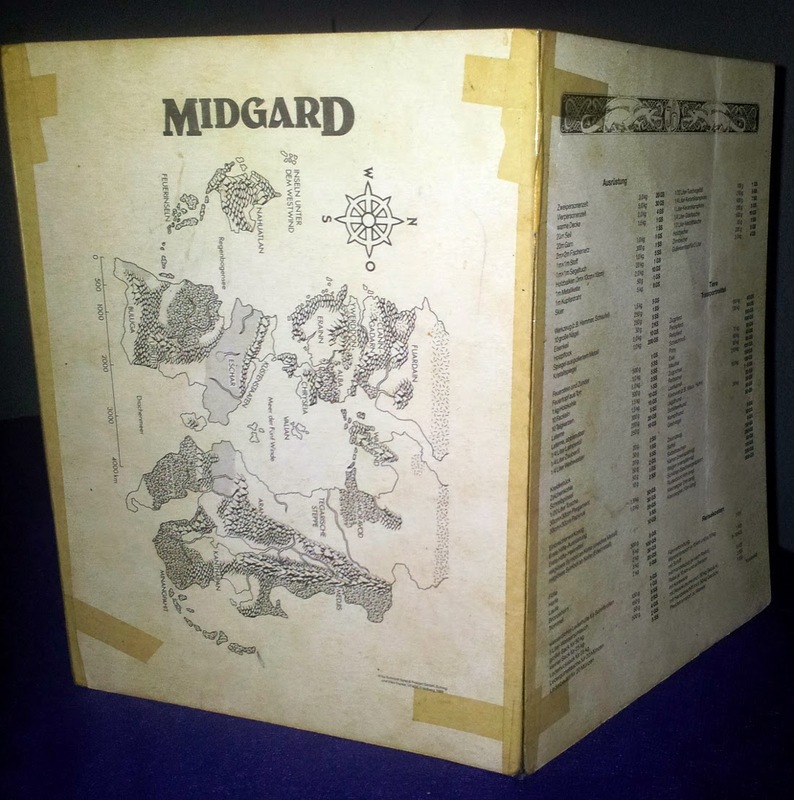 Again, it works very well to produce the feeling that you are playing D&D and if you are in the mood to take it easy, this is a good way to get it done. Parts of the game are easily enough ported into other games. Here, again, helps the narrative focus of the game. So many nice ideas for aspects of D&D that either just get narrated or are burdened by clumsy subsystems and in a game that's for free, it's almost a crime not to read it at least for that reason. Two of the main problems I have with Dungeon World are the rhetoric and the presentation. Some of the arguments they make how this game is supposed to be played reduce the DM in my opinion to an entertainer, just channeling the awesome ideas someone else had. Game Minion, not Game Master, as I wrote in part 2. It's bad and not something a beginning DM should start with. And the presentation (in the printed version, anyway) makes it worse, as this book is just too hard to navigate and impractical to use at the table. A changed order of topics and some serious editing would have been in order with this one. Both weigh heavy on an otherwise excellent system and make for a very bad first impression. In that regard, I don't believe it suitable for newbies to the hobby. To sum it up, I'd say, go and read Dungeon World, if you haven't done so already. I believe there's a lot to gain from it. Buy the book, if you want to support the creative talent behind those rules. But don't expect more than an artifact. Avoid the pdf or get Truncheon World for free (a shorter edit of the same text with an additional class and another order of chapters). And don't let them tell you that you are not allowed to do with this as you please. I will definitely give this baby a spin or two, maybe I'll even write a bit more about it as soon as inspiration hits. 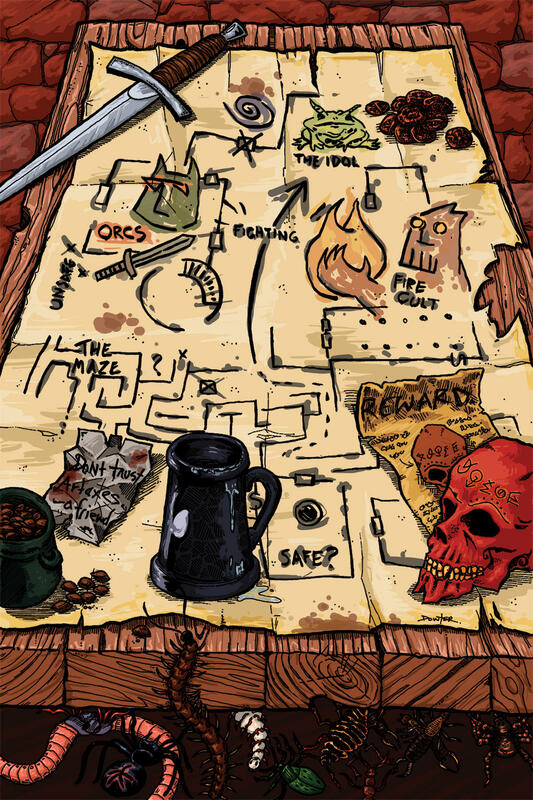 And I hope bits and pieces of this huge load of text (way too much, I know) helped getting you all some ideas about Dungeon World and what it could be used for. If you read all or part of this, I hope you found at least some enjoyment in this series of posts about Dungeon World. Part 2 is here and part 3 B is here. This is the first part where I try to dissect Dungeon World and offer it's parts for free. In other words, in this part I'll describe how I intend to use the game and part 3 B will be about what I would house-rule (impossible! ), what I intent to borrow for my personal Frankenclone of D&D (insolent!) and why I believe that D&D could really benefit from Dungeon World the way Dungeon World benefits from D&D (outrageous!). Took me some time to wrap my head around this one. It was way more complex than I'd have liked (I have seen several posts/etc. online where people state conversion from one game to another was a breeze and I have to say, well ... they are all lies). Here now is the first half of the third part of this series. If there's anything else I can come up with or found online or problems I see (or whatever), it will be either in this post or in the second half (short of a play-report, that won't happen until after Christmas). I can't imagine using this for a campaign. As I wrote in part 2 (I think? ), the game does a stellar job emulating D&D up to what would amount to the levels 6 to 9, but that's not enough for me. Or at least, that's not D&D for me, as there's also a domain game and an epic-level game as a big (but often neglected) part of D&D that I'd like to explore in the future. I know, I know, some would say Dungeon World is not D&D, so a campaign in DW would be something completely different than a campaign in D&D and that might be (to some degree) right. If you where talking about the rules of the game. Not so much when you talk about the result of the game (which is the narrative that is left after the game is finished, for those wondering ...). And here, DW falls short. After level 10 the game is over. 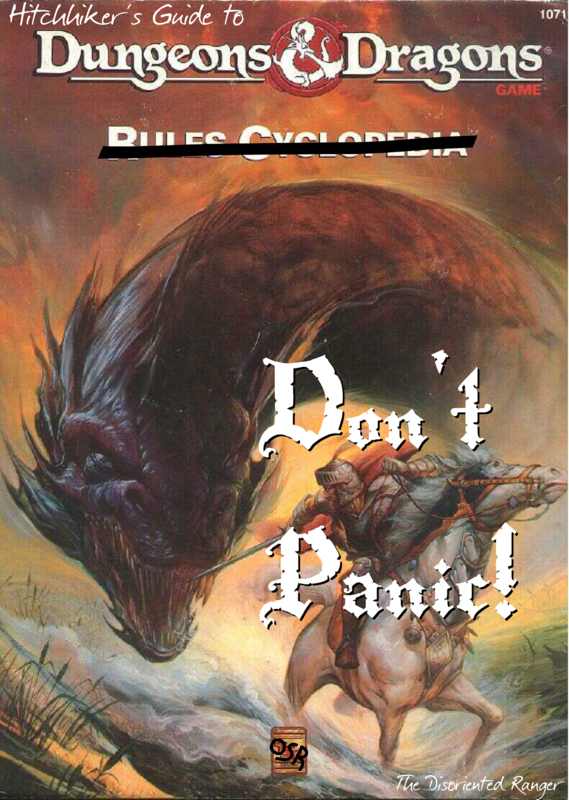 So (arguably) a campaign in Dungeon World stops when the D&D Rules Cyclopedia merely finished the introduction (didn't Gygax say somewhere that character development is something that happens on the first 6 levels of a character's existence?). Where it should work, though, is emulating some of the classic modules that have been collecting some dust on my shelf by now. I decided to make a test run with the first level of Rappan Athuk (first print-run, back then it was still 3E), because I know the piece and re-reading it should be a breeze. It's also a beautiful dungeon and meat-grinder in D&D and I'm curious how it translates to Dungeon World. In this context, I'd use the game RAW. It didn't take me long to realize that converting a huge dungeon like Rappan Athuk came with it's very own sets of difficulties. For one, there's a lot of crunch and specific fluff in the original books, but the biggest problem is regarding it's deadliness. There are no light decisions in this. Done wrong, it's either a fast way to kill the players or way to easy for them. Finding that sweet spot in between might be hard for someone new to the game. As stated in the introduction, it took me some time to wrap my brain around this one. So the main problem (in my opinion, anyway) is that converting anything from another system to Dungeon World will not only warrant a deep understanding of the rules, but also an understanding of what's happening and how it translates to Dungeon World as a game. In other words, a DM needs to see how a module is supposed to work (express itself?) at the table when using the original system and then needs to decide how that could be done in DW. I'll show how tricky this can be with an example how I would kick off a Rappan Athuk Campaign with Dungeon World. Semantics first. The whole book is written like this, by the way. But that's not the main focus here. The first thing I'd like to point out is that this shows how much influence the players really have regarding the world and the session, which all in all amounts to ZERO. Yes, you got that right, I think the players influence on the adventure and a campaign as a whole is not at all affecting the DM's preparations. The DM decides where to put the players. They are in the middle of the action (which needs to be prepared) and all the moving parts are already in motion and labeled (fronts, dangers, individual monsters). What are the players allowed to decide? Why they are hunted and by whom. BIG decisions right there. I'm joking, of course. In the best of cases this is just rhetoric, but taken at face value it's trying to substantiate the illusion that an adventure is about the why and the who, instead of the how. Let me elaborate. I'll try and keep it short ... The main impulse in the example above is that King Levus has some beef with the characters. The question for the players is not "Who is King Levus?" but "Why is he so mad?". See the difference in the quality of the questions allowed? To put it a bit different, if the DM is allowed to ask the questions as he sees fit, he'd be quite stupid to not limit and manipulate the possible answers by governing the questions he will ask. Dungeon World gives a DM tools to manipulate the outcome of a situation on a semantic level instead of by a set of rules. I'm not quite sure if I like this or not. It makes things way easier for a DM, though. Back to converting Rappan Athuk (this will contain minor spoilers). Getting them directly into a tense situation will mean they already arrived at the entrance and the surroundings decided to act against them. Okay, this cuts down the whole bit about gathering information and getting there, as it is reduced to a part of the Flavor Text introducing the players to the campaign. Again, I take what is already there (a few rumors about the dungeon, a description of them arriving there and what it looks like) and ask them some "unimportant" questions like why they went there and what they are feeling about this etc., etc.. So far, so good. But it's action they want and it's what they should get. But where to start? The Ground Level of RA is a rat-infested graveyard with some mean Gargoyles, a well and 3 mausoleums. Way too much room for the players to navigate. If I put them under attack in the open, they are most likely to retreat and start with a new approach under their conditions. There also are several ways to get into RA, but DW is not about exploring the surroundings, it's about exploring the narrative. If I want them in there, I need to put them in there, which leads to me deciding which entrance they chose and how they entered. This, again, reduces the whole Ground Level to Flavor Text (that's a lot by now) and puts them into the mausoleum, which is the entrance to Level 1. Anyway, on we go. I decide they didn't find the key to the mausoleum. If they had free access, it wouldn't put them on the spot. Because, if I led them to this point in the narrative and describe a mausoleum with no obvious entry to a dungeon as the starting point to enter the dungeon, they will do two things: (1) they'll check the sarcophagus (which could at least trigger an encounter) and (2) check for secret doors (which would make them find exactly that). Using DW means using moves, which would mean the thief would use the Trap Expert move and the rest would follow with the basic move Discern Reality. In both cases a success would make (1) somewhat unlikely to happen, which leads to them just finding a secret door to the dungeon without meeting any resistance. No key for the players means they forced their entry. Which triggers the death trap: the ground will start to move upwards and will meet the ceiling in 5 minutes. The secret door will be blocked after one minute. The entrance will be blocked instantly (the door moves inwards) and the sarcophagus would allow enough room for 3 small characters, but there is a mean skeleton in there that gets animated as soon as someone does as much as lifting the lid. And fight would make discovering and opening the secret door more unlikely. That should do the trick, I suppose. But still, there are at least 4 moves the characters could use to get out of there quite easy. A roll of 7 or better with 2d6 will save those hides (which has a ridiculously high success rate, considering the bell curve results), so it's not really a challenge. If they disturb the skeleton, they really might die right there (with a good chance that up to 3 players manage to survive the encounter by getting into that sarcophagus somehow ... the trap would reset after two days). Still, most likely too easy. And I'm talking level 1 characters here, not no less than six characters of at least level 3 (or higher) when using 3E D&D. When I started doing the converting, my first thought when reaching this point was "And all that thought and consideration was just for one room ...". Yeah, I could go on like this. The level of detail needed when converting this is, if done right, excessive. The first level, for instance, has one very intelligent and dangerous monster the characters can't fight directly, many, many rats and the holes (and tunnels) in the walls to match them. The rats, in turn, work for some wererats that protect the stairs to the second level (which makes them very well informed and prepared ...). A priest from a lower level comes on a regular basis to check on some of the traps (there are at least 3 of those) and the random encounter table also indicates some ghouls/ghasts and gelatinous cubes. To make this work properly, a DM needs to know how the deeper levels might interact with level 1 and how fronts could be used to explain it. As I stated above, if I where to do this in a way that I end up with something that at least resembles the original and works somewhat like that massive and evil dungeon, it would be a lot of work. I'll leave it at that. Maybe converting Rappan Athuk to Dungeon World would be a nice exercise for another series of posts in the future, but for now this is more than enough to get a first impression (I hope). Is it worth the effort? Hard to say. Contrary to my initial impression, Dungeon World seems not really suitable for conversions from other systems. It can be done, but if a DM wants to catch what an adventure did in the original system, he really needs to put in the work to get it done. And that on a level of detail that goes way beyond what the source had to offer. And having to navigate the book was frustrating, so that's not good. I'm still waiting for my copy of The Red & Pleasant Land. Maybe a sandbox might agree better with what Dungeon World does. And I have to say, it helped me getting a new perspective on what dungeons can be in the game. Details do matter and how they translate from the system to the narrative at the table is worth pondering on. Dungeon World did encourage this and it is potentially useful in all fantasy role playing games. 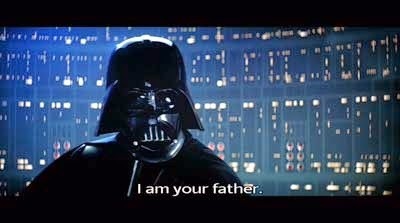 But more on that in Part 3 B. Part 3 A is here, part 3 B is here. I appreciate flexibility in a set of rules for a role playing game and if I take the time to read a whole book full of rules, I'd really like to be inspired by it. Not by some horrid game fiction (which I already hated on in part 1), but by examples what the rules can do and clever little ideas where I get to think "Yeah, I'd really like to have that on my character sheet/in my game ..." or "This would be perfect for a setting like ...". It's like the difference between a board game and a role playing game. One needs to be confined and ritualized to achieve it's intended goal (which is fine and mostly doesn't need that much rules), the other one excels in giving rules that are more like a vehicle, with the players being free to choose their destinations and the way to get there (which usually goes with a more complex set of rules). See, it ain't much. Take the D&D trappings, strip them down to some of the terms (like the six ability scores, HP, spells and class names) and use a fast and easy system to resolve all possible situations: roll 2d6; everything 10+ is a win (sometimes with an additional advantage), 7-9 is a win associated with some sort of disadvantage and everything below that is a disaster (ability score/class/level modifiers do apply). In the beginning it sounds very much like D&D (up to a 3d6 in a row character generation) and I started to ask myself where the difference might be. Turns out, it's not D&D at all the further one gets with reading. Your ability scores, for instance, will be used for 3 things: to generate a modifier, a characters HP (Con) and to get a better price for wares (-Cha). You won't need them anymore than this (which makes their use rather cosmetic). The rest is moves and tags and bonds. This is where the whole thing starts to shine for me. Up until page 154 I really loved what this game proposed to do. It is very narrow in what it does and heavily structured, but I think I would have a blast playing this. So many fun ideas, like the "bonds" for instance (which give a group almost instantly opportunities for role playing) or how every ability score is associated with a move. There are two sides to this, of course. Alignment is an example that might help illustrating how those are really nice, but also very constraining rules. After choosing a class, a player is confronted with a choice for up to 3 available alignments for that class. Every alignment is associated with a certain action that grants a character xp (neutral fighter: defeat worthy opponent, etc.). It has a nice effect on the game that fits the alignment, it's easy to remember and it pushes all the right buttons in offering xp for using it. It's also just the one thing you can do to express your alignment. Everything else is wasted breath, as the rules do not support it. Character creation is the same. You'll end up with a very nice character, but the process of creating a character is very formulaic with very few choices (or just enough, that's a matter of perspective, I guess) and a very narrow understanding of what they mean in D&D. This is divided in some principles and associated with some moves a DM is allowed to do. Seeing this as only advice might have some merit, but as they present it, it is set in stone. There is a chapter in the end with some ideas how to change those rules, but it falls short on the DM, basically saying that changing this will be too much work, if not impossible. All this might be helpful for a beginner DM, but it also gives the impression that the game is always right. It's not the DM that decides how it's played, he's just a vehicle for the rules. I disagree with that and I really don't see where the fun for the DM is to referee this game. It couldn't be building a setting, because the third point of the agenda really forbids it and there are several passages in the book where they state that the game will "resist" attempts to avoid this part of the agenda. "Game Master" is reduced to "Game Minion", I'd say. Anyway, a DM is not to have his "own world". Let's go with that. It's something that emerges from play and the players are a huge part of this process. This has huge implications, to say the least. And it has definitely nothing to do with D&D, where the story emerges from the decisions made by the players (as in: the complete opposite to what DW proposes). I wouldn't say they lie to you with the agendas, but they go to great lengths to tell you that you have to follow "The Rules", especially when you're creating a world (which, following the third agenda, wouldn't amount to much, since the world is created during play ...). Then they go on about how to create a world in sketches, starting with some fronts. And that's some good stuff right there. "Fronts" are exactly what you would expect: the front ends of campaigns the characters are aware of. They are like doomsday devices, ticking down as long the characters don't do anything against it, changing the world for the worse, should they come to pass. "Steadings" are places the characters may rest, heal and buy stuff. A nice collection of ideas how to shortcut everything between adventures (same goes for travel, resource management, making camp, all that jazz). Those rules help not only facilitating those intermissions, but also produce a living environment for the players to interact with and form a nice narrative around it in the process. Without much fuss, I might add. So what are they trying to do here? The main focus of the game is the players. The world around them emerges as they discover it and a DM doesn't really need much more information than that. Sometimes they only see the tip of the iceberg and the DM has a sketch of the whole thing. Or they had only heard the name of another steading nearby and the DM already has all the data needed prepared. I can get behind this sort of thinking. It's actually not that far away from how I prepare my games, just more structured (which I can appreciate). Seeing it like this means, in the end, that the narrative control is still with the DM. The rules don't "resist" attempts of a DM to enforce a story (nice try, guys), but they show how much is too much. And that's good advice for every DM in every role playing game. And to give the players an opportunity to help developing minor details of a setting, is good advice too (and something most DMs allow anyway, one way or another). But the context - the big picture, if you will - is still part of the DM's job, even in Dungeon World. Combat is an odd bird, now. As far as the rules are concerned, aspects of a combat are just moves that help figuring out where the narrative goes. There are tactical elements to combat, but they are very limited and mostly related to a class (a fighter is good at killing stuff, of course), tags (what weapon exactly is used, etc.) and the situation (if the opponent is not aware of the attack, it's not combat, but just doing damage and if the enemy is too strong, it's only combat if the players find a way to harm it in an effective way). So combat is focused on enemies that fight back and can be defeated. Depending on how serious you take the advice to ignore (or "re-interpret") damage that could kill a character (to keep the narrative going, etc. ), you'll either have a game where fighting is like visiting town (read: part of a nice but harmless narrative) or a game as deadly and tactical as you like that still holds an engaging narrative (I'll take option number two, thank you very much). The rest is with the dice. A character may, for instance, decide to reduce his ammunition (and still do his damage) when coming up with a result of 7 to 9 in his attack (so ammunition is a rather abstract resource that gets depleted as a result of the narrative, not something you count down as you use it ...). Or he decides to put himself into harms way instead (still doing his damage). So the result of the dice may decide movement (and other factors) instead of the simulative approach of our beloved, war-gaming-haunted D&D. I like this approach as an alternative, but it's still one more aspect that creates a significant distance to D&D (and friends). It's not all said and done yet. The third part of this review will shine a light on some other rules I really liked (Hirelings and travelling, for instance), as they beg to be hacked and stolen for ported to D&D. And I've written enough for today as it is. Dungeon World is a mixed bag, but I've seen more I like than I dislike. I really don't care much for rules that protect players for the sake of a "story". I've seen that a lot in storyteller games (and ignored it every time). Death can be an interesting part of a narrative and the possibility of dying is an effective tool to produce tension in a game. That's how it should be, in my opinion. What really makes me flinch, though, is when a set of rules tries to tell me it's mechanics are the game and the DM is just the vehicle to enforce them. That's just plain wrong and reduces the DM to being an entertainer. There's also some redundancy (like a chapter about how to DM a first session and one chapter in the end about how to teach the game), the order they arranged the rules in is a bit screwed (especially in the second part of the book, Weapons and Equipment are a good example for this) and there are some contradictions (you either "play to find out" or you sketch a chain of events that still comes to pass, even if it's ignored, etc.). But those are minor quibbles, because it really ain't that complex a game. Anyone interested enough to check it out, but still hesitating because of the redundancies and contradictions and messed up order and the bloat (etc.) I wrote about, should give Truncheon World a look (thanks again to +Joel Bethell for pointing it out). It's basically the same text (minus the monsters, adding the barbarian class), but better arranged and only 128 pages (same format, by the way). The monsters can be found here (among other places, I'm sure). The virtual version of Dungeon World is free under the creative commons and you can play this game without ever paying a cent for it. This was, to be honest, one of my main reasons to invest the 24 bucks for the softcover print-version of the game. It's, in my opinion, how games (most media, really) should be published in the 21st century and I can only support this sort of strategy. That being said, paying for it gives it's physical manifestation some value and it needs to be considered in a review. So this will be where I start in part 1, followed by some words about the overall presentation of the rules and the structure. Part 2 of this series will be about the rules themselves and how this game is supposed to tick. Part 3 A and B will be about hacking parts of it into D&D and some ideas what a conversion could look like. 3 A is here and part 3 B can be found here. The product that can be bought at stores is the result of a very successful kickstarter. They've made more than 20 times of what they estimated to be their minimal entry costs to realize the project (started with 4000 Dollar to get it done, ended with a bit more 82.000 Dollars pledged!). Considering this, I'm really underwhelmed by the physical artifact. 405 pages, with an almost lavish layout that gave me the immediate impression that 300 pages would have sufficed (and that was even before I had read the text). I love the cover illustration, but the rest (which doesn't amount to much, really) is not that good in quality, rather bland and generic. Well, at least they don't work for me (with maybe two exceptions, but it's all so uninspired, that I wouldn't have missed any of it). And it is quite obvious that the pictures they ordered had been colored and were rendered black and white afterwards (so they paid more to get colored artwork and used it black and white to save expenses with the print-run?). Every illustration takes up a complete page, too (so again with the lavish layout ...). The binding seems solid (which is a good thing), but the pages are quite thin for something that would get lots of use at the table and it's really hard to tell how the book would hold up in this regard. 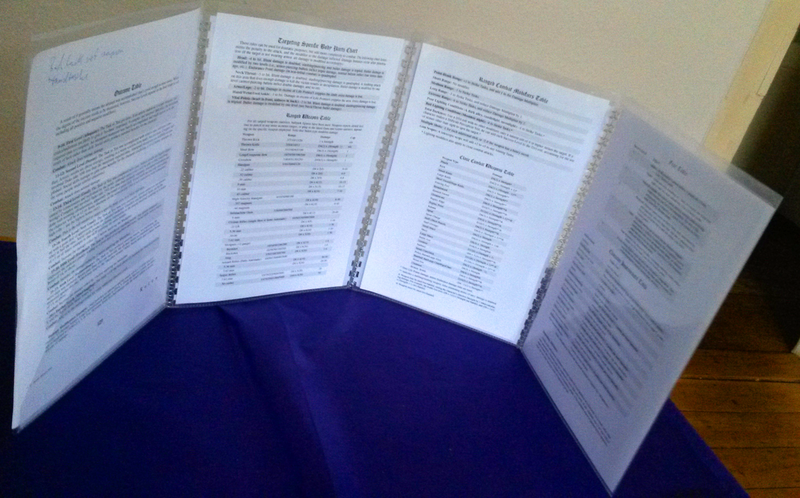 One might argue that the thin pages are due to the format (6x9 inches) along with the high page count. But, as I already wrote above, they were really wasteful with their space, so I'd say this could have been done better. Not a good start. It all seems a bit unprofessional and not very functional for a role playing game-book. And that despite the huge potential that kickstarter should have made possible. So. Much. FLUFF. So unnecessary and dull. They are excessive in wasting space. Again. Considering the amount of real substance in this book, half the page count would have been more than enough (a third might be possible, if a bit cozy). Even in this format. This is bloating the content for no good reason. No running titles or any other indications where you are in the book other than page numbers (something like running titles can be very helpful when searching stuff in a book) and very broad marginal columns (mostly empty or with movie/tv-show quotes, again a waste of space). And I already found a word not referenced in the index (tried to find out what "hold" means). Add the bloat to it and this thing is harder to navigate as it should be. There are several well placed examples for how those rules are used in the game, though. I liked that. So far not at all what I think can be expected from a rule-book. With some tight editing this could have been a solid 150 pages hardcover with some structure and on robust paper for the same price (or just a few Euros more). Especially considering the number printed (more prints of the same make it somewhat cheaper/more cost-effective and the book I own is already the third printing ...). I don't know if I would recommend buying Dungeon World just going by the presentation, the material and the internal structure. It's not that expensive and if you like the game (and got the spare change), it's one way to support the designers, I guess. Next up is a review of the rules. It really gets better once you start reading it. (open in a new window to get an even closer look ...). This is of course (but not only!) about that post I wrote on Monday how charisma might better be replaced by something else (here). It resulted in some very interesting discussions and there was way more feedback than I would have thought possible for something I wrote. An interesting experience. There also were some people on g+ who wouldn't see a benefit in changing charisma, as the term does what it is supposed to do. With this, I can't agree. To question a rule helps to understand it. To understand a rule opens it to change, to evolution even. Anyway, I thought instead of arguing my case any further, I'd rather demonstrate what I meant. That's why I threw this little thought experiment together. I worked mostly with synonyms or abstract variations of the original words. Some I really like, some are just for the sake of change. ** Saves stay the same, because it would be a good description in any dimension ... The rules are not changed, just how things are labeled is different (but still means more or less the same). And that's, as far as semantics go, rather cosmetic. The effect, on the other hand, is immense. 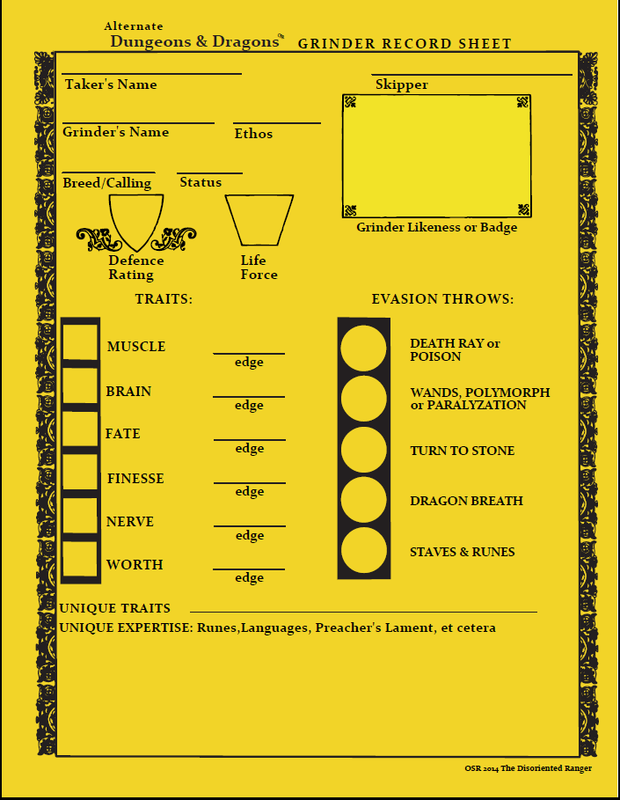 You can play D&D with this sheet, no problem. It would sound very different, though. See for yourself how words alone, even if they mean the same, change a game without changing any rules. * Those are .png for now. If someone has use for a pdf of this thing, I will provide that too. Etymology: The branch of linguistics that studies the origin and history of words [source]. Well now, in yesterday's post I entertained the idea to use the world of Siegfried and the Nibelungs for a D&D fantasy setting. As it is, I'm sitting at home with a cold and lots of time to think about stuff like that. And I own a physical copy of The Song of the Nibelungs (many versions of the text are in the public domain by now, of course, so everybody is free to check it out). I started to read the introduction early in the morning and it got me thinking instantly. Here are my thoughts. Perspective is the thing, I guess. With The Song of the Nibelungs we talk about the 12th century amalgamation of two Germanic folk songs (one about Siegfried's adventures and one about the fall of the Burgunds) for the readership of that time. From today's perspective, following the train of thought in said introduction, we are confronted with two different mindsets: the one of the Germanic people and the one of those living in the courtly 12th century. In short it's the ur-heroic mixed with the chivalric, re-discovered in the early 19th century, translated (my edition) in the mid 20th century and mirrored on 21st century sensibilities (today's readers). It's like a barbarian playing a knight in a movie of a Tolkien-translation of some romantic novel written in fake Middle High German ... Or something like that. You see, it gets quite complicated down the road. Now, now, hold it! Shouldn't this be about Charisma? Yeah, I know. We'll get there. 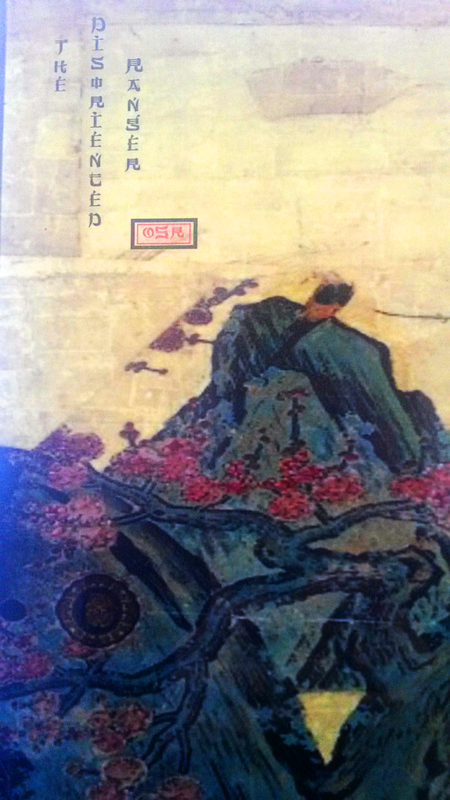 The thing is, the original (anonymous) author used what he could find of those old myths and transcended them into something that could be recognized in his cultural surroundings. And the mix of those two produces something new, something that the King Arthur stories that were popular at the time didn't do (somewhat of a spoiler ahead, I guess): it kills them all and measures how heroic/chivalric they are by how they go down. That's, of course, very hard to recognize nowadays, as (and here we come close to the topic of this post) our understanding of the terms and ideas in the text is so completely alien to what it meant when written in the 12th century (emulating those terms and ideas of the 5th/6th century only partially, too). If one in the 21st century were to transform this into a role playing game or a setting, he'd had to understand where all those terms originate from to use them for the game in ways that help building a bridge between the source material and the player at the table. There is a lot of weight on the terminology of such a game. Done right, it really helps facilitating a certain atmosphere that helps players getting in the mood (and staying there while using it ...). Terminology is not one of D&D's strong suits. In my opinion, at least. Think about it, why is it called "Hit Points"? "Points" is a very abstract mathematical term and it doesn't quite apply, does it? How about "Vigor" or "Vital Force" instead? There are many bad examples like that* and Charisma is one of them. That's why I changed it to "Luck" in our D&D game a few years ago. First of all, Charisma is (in it's origin) a Greek word. And it shows. That's not a bad thing, as languages do that a lot. It's even not that interesting. Far more interesting, though, is the fact, that if a language takes a new word as it's own, an at the time prominent/influential second language will provide the solution. So history is an essential factor here. Autobahn, Rucksack and Kindergarten (for instance) are examples for German words that got assimilated into the English vocabulary in the 20th century. Beef, on the other hand, was a french word that found it's utility in the English language back in the 13th century (France being quite big in England at the time) and has been popular ever since. The kicker here is: the time a word finds it's way into a language, is the time the word was needed. In other words, it formulated a concept that didn't exist before that exact point in time. Which could lead to the idea that when deciding which names to choose for a game it could be only helpful to check where those words originate and go from there. And this is where Charisma as a word disqualifies itself (google found the whole story here). The word's not even in the area until the end of the 19th century! How we use it today and the meaning it holds (it's not much, but anyway) has nothing to do with how a 12th century writer would describe a 5th century hero ... and that's something that today still resonates in the word. But how to rename it? For a D&D variant based on The Song of the Nibelungs, I would not use the term "Luck", either, as I don't like the positive connotations it holds that much. It needs something a bit more threatening, with a hint of doom in it and some magic. I'd propose to use "Wyrd" instead. It carries some dark foreboding while being true to the source and it's the evil father of the word weird, which is a nice bridge to translate (and weaken the original meaning) into a game. Just in changing the name of the ability score, it gets a completely different vibe without the need to change any of the mechanics. Somebody with a high Wyrd might be in the gods favor and attract followers or impress strangers, while those with a low score tend to get into fights a lot (and so on). A player may take any amount from his Wyrd score as a bonus to saves or to reduce damage he received. The only ways to regain those points are (1) plus 1d6 whenever a character gains a new level (up to the original maximum), (2) a wish and (3) a difficult quest for a divine entity. In all other regards it's treated as an ability score, so it might be subject to attacks that reduce it as a form of damage. 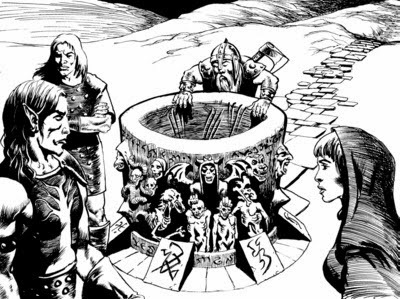 If for some reason a characters Wyrd drops to zero, it can't be regenerated by any means from there on and the character will meet a tragic doom as soon as it's convenient for the DM (but within the same session). That's how they die in The Song of the Nibelungs. Forcing their cards as long as possible until finding a brutal and dramatic end. It's how it should be in the game. ** A variant of the rules I wrote for Luck, as linked above, and what I intent to use from now on. Works just as well if you keep labeling it Charisma, of course. It's not only the trailer for a movie that might never happen (which would be a shame, I'd totally go and see this), but it's (also?) promoting a comic book series by Alex Alice called Siegfried (based on Wagner's Ring of the Nibelung, some of it is the background-music in this amazing short) that looks equally awesome*. I'll definitely give this a closer look. And it reminded me to go and check if somebody already made a role playing game/campaign setting/what-have-you using the The Song of the Nibelungs ... I mean, it got a Dragon, magic items, heroes, dwaves and a story that could make Game of Thrones blush. 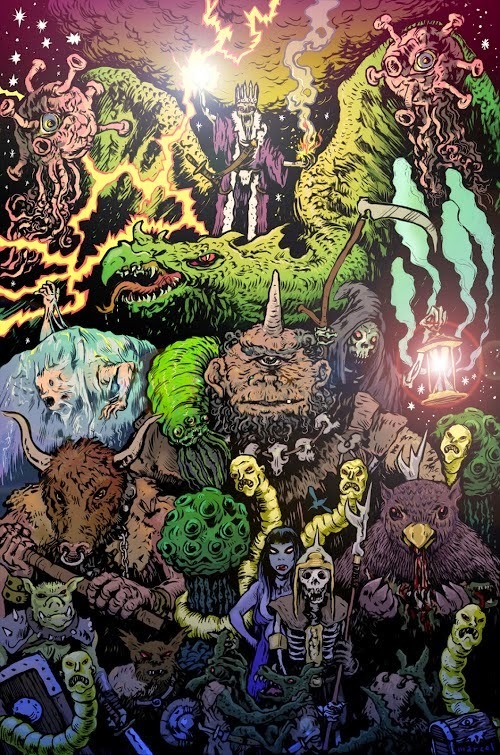 A mix ripe for a very gritty and dark fantasy setting with some Brother's Grimm fairies in it and a strong Dark Ages vibe to round out. Turns out, nobody did something like this just yet (or my google-fu left me). * Thanks to +Joey Lindsey from Metal vs Skin to send me down that particular rabbit hole (with this post). I really love to use DM-Screens. The main reason being that my players don't have to see what I roll. Or better yet: I believe it's far more effective to allow players sitting next to me an occasional glance behind the screen. Or decide on the fly to roll in the open to heighten tension. The more I think about it, the more I come to the conclusion that DM Screens are necessary tools for so many reasons. You may have huge amounts of information for the game at your fingertips and, if need be, protected from prying eyes. 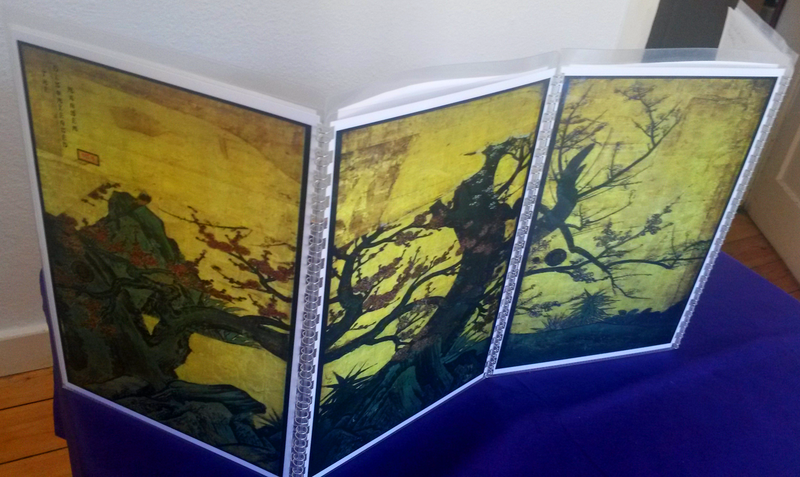 And let's not forget, the art depicted on a DM screen helps facilitating a mood for your games. Anyway, most will be aware of those benefits, some might even disagree. But I believe there is no DM out there that likes DM Screens and didn't experience the annoyance coming with some of the published proposals. Like bad/ugly/stupid art. 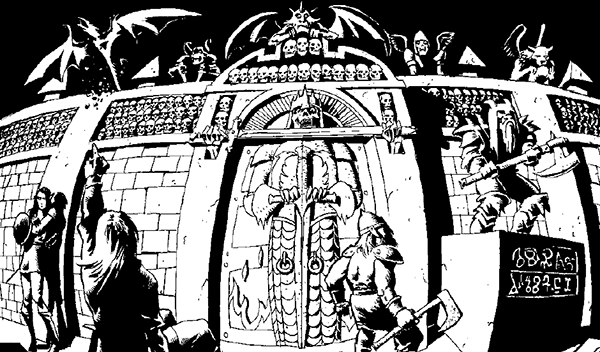 I really hate, for example, the art on the 3E DM Screen. It's such an ugly thing (and I won't post a picture of that aberration). One could say they take this idea to the MAX (which is kind of funny, I guess ...). Layers and layers within layers and layers of information. It's just too much. Way too much. I tried to use it but always ended up looking in the books. Did use this a lot! Good times. Used almost every Friday for five consecutive years. And it shows (it did hold up quite well, though). 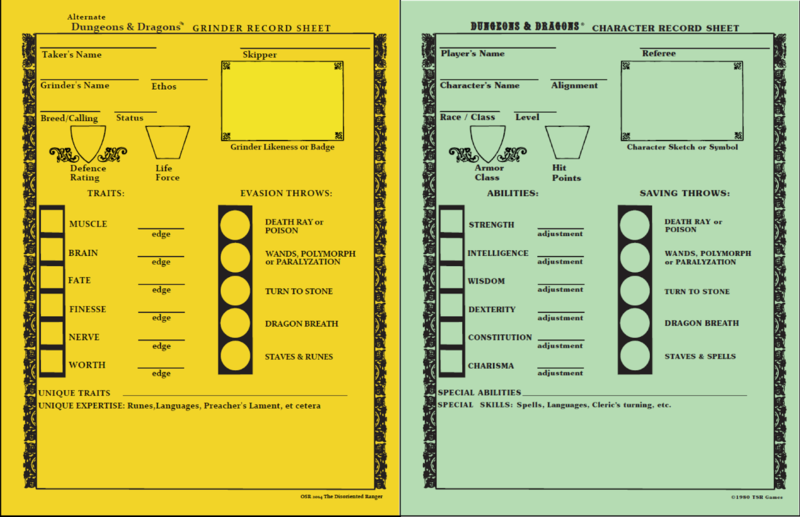 The last thing that will eventually happen to all published DM Screens is that they get obsolete because of a new edition (which would be true for all three DM Screens described above) or because the Dungeon Master decided to go with another game (also true for all three examples ...). When I discovered those small blogs that would form the OSR later on, my focus in gaming also changed to older games (The D&D Rules Cyclopedia ftw!) and all those small games that got published (often for free) in that particular blog-o-sphere (and some indie-games I could get my fingers on ...). It won't come as a surprise that DM Screens are a very rare thing for those games. So a DM would need a flexible and neutral screen for this. Of course those things can be bought. But I never saw one that I liked and why buy one if you can do it yourself with all the freedom you want to get what you need? ... and with the name of the blog and an OSR stamp to round things up. I'm quite fond of it by now. All I had to pay for this was the material and the copy-shop clerk who laminated and bound the pages. 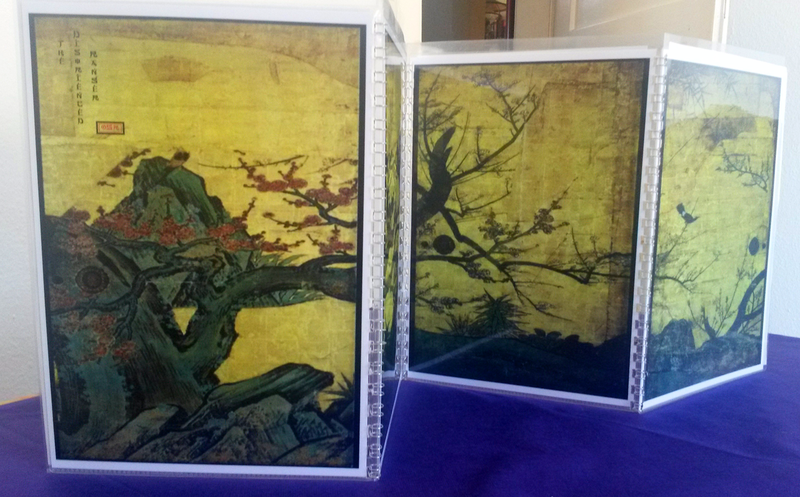 The art is the picture of a historical Japanese room divider (public domain, too), which was ideal, because it was already divided into 4 panels, so stretching it to DIN A 4 and making 4 pdfs out of it was quite easy (doesn't even look stretched). Adding the name of the blog and the stamp where the final touches using The Gimp, Scribus and Inskape). which resulted in the white frames you see above. This is it. I'm using this one for a year now and it came in quite handy so far. I lucked out with the art, as I really like that picture and the atmosphere it transports (took me some time to find something I really wanted to use). And it's system neutral, so to say. Question to the readers: What's your DM Screen of choice and why? Setting: Dirkterwalde, a mysterious backwater-town in East Germany at the end of the 90's (see here for the campaign set-up and here for an introduction to Dirkterwalde). Characters (see here for a full description of the cast): Vale Viem (witch and owner of a small cabaret), Jan Jester (mundane sausage-salesman and a thief) and Gabriel Zöller (powerful psychic and a nerd). The year is 1999 and it's Tuesday, the 7th of July. A mild summer day, if you believe the records. Nothing really interesting was happening in the news, many people were on vacation. All in all it was a really unspectacular summer in East Germany in general and in Dirkterwalde especially. I would hazard that on a day like this people actually thought more about either seeing Notting Hill again or checking out The Matrix instead (because everybody was talking about it) than about the upcoming Millennium and the end of the world (or other dark topics). It's a nice evening. Jan and Gabriel decide after training (both frequent the same dojo) to go for a beer and see, as they often do, the evening performance at Madame Viem's Varieté Obscure. Lots of beautiful young women, reasonable prices and it was just a stone's throw from the dojo (it didn't take them long to become regulars). This is where the 3 characters meet each other. The only event this evening worth mentioning was a poor old Sorbian woman that had managed to get into the Obscure to sell her trinkets to the customers. All three bought a small trinket before the woman was ushered out politely. They stay until the end of the evening's entertainment and part ways after that, doing whatever business they got left for the day and went to bed after that. As they fell asleep and entered their dreams, a Willpower-check was in order. Gabriel was the only one succeeding and thus the only one being aware that he's dreaming. Jan and Vale accepted the dream as reality (what one might call "dream-logic" worked for Jan and Vale, but not for Gabriel). A strange and frightening dream followed. In their dream they were all back at the Varieté Obscure. Gabriel in front of it, Jan and Vale inside. The Obscure and the street going past it looked ruinous and deserted. There was no electricity, just a diffuse flickering light brightening the clouded night in the west of town. When Gabriel saw a strange group of people with torches coming down the street towards him (they'd looked like Neanderthals in medieval armor) he decided to enter the theater. He heard someone talking, went for the noise and discovered Jan and Vale discussing their situation. Since he believes them to be part of his dream, he chats them up as if they were old friends, uses his abilities to ignite candles and makes them fly around, stuff like that. Jan and Vale on the other hand accept this to be as it should be anyway, since they are not aware of their dream-state. Now, them talking to each other startled something on the floor above them and they decide to follow that noise. A door leading to a hallway with some stairs to the first floor is by the bar. Jan takes the front. He thinks a gun would be helpful in this endeavor and discovers he's already carrying one. Vale got a sword the same way: it has been there all the time. "This ain't your realm no more, humans. It is Zardok's realm now and you are not welcome!" Examining the first floor they found the first rooms empty and demolished. One showed traces of old blood, another one looked like an improvised camp site. In the fourth room they discover a suicide and a note with the sad tale of a girl that hoped to get a chance and the world disagreeing. Vale checked if she knew the girl, but didn't recognize her. Meanwhile they hear someone calling for attention down on the street. An old man in his pajamas who seems lost. They identify him as one of the guests of the Obscure just a few hours ago and think that he, too, might have bought a trinket from that old lady. Things escalate pretty fast from that point on. The man gets attacked by those small creatures from the kitchen (or very similar ones). The group tires to help. After some shots are fired, a dragon makes an appearance and tries to burn the old man, Gabriel and Vale. Both characters wake up before dying in the flames. Jan fights some of the zombies that managed to break free from the cold store until they manage to overbear him and he, too, wakes up before it gets worse. I was quite happy with this first session. It seems like not much is happening, but it was more important to give the players a feeling for the setting and give them a chance to meet and establish some connection between them. What I wrote about WitchCraft the other day still holds true: very fast, very flexible.